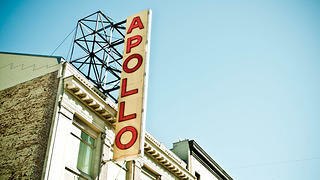 The blade sign of the Apollo Theater in Harlem, New York. 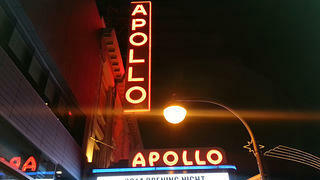 The Apollo Theater in Harlem, New York, was a major influence on a variety of pure American music genres—jazz, swing, bebop, R&B, gospel, blues, and soul—in the 20th century. 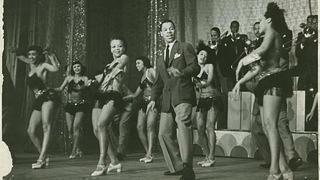 And, starting in the 1930s, it was also a place where African-American performers could gain exposure to a wide audience of their peers. For years, the Apollo was the only New York City Theater to hire black entertainers. Designed in the Neoclassical style by architect George Keister, the Apollo first opened in 1914 under the name Hurtig and Seamon’s New Burlesque Theater. Black performers and audiences weren’t allowed in the theater until 1934. After future New York City mayor Fiorello La Guardia began a campaign to stop burlesque from permeating the city, the theater closed in 1933. It reopened as the 125th Street Apollo Theatre in 1934 under owner Sidney Cohen and was later purchased by Frank Schiffman and Leo Brecher. At the same time, demographics in Harlem rapidly shifted from primarily white to predominantly African-American—and African-Americans were pushing boundaries in the entertainment sphere, both in New York City and across the United States. The historic No. 2 Chorus performs at the Apollo. The newly reopened theater turned their attention to Harlem’s large African-American audience and by 1937, it was the largest employer of black theatrical workers in the U.S. More important than headliners such as Ella Fitzgerald and Miles Davis, however, was the impact the Apollo made on the lives of up-and-coming performers through feature programs like its Amateur Night. Names like Sarah Vaughn, James Brown, Jimi Hendrix, and Gladys Knight arose out of Amateur Night during the theater’s heyday. The Apollo Theater Foundation is also restoring the Harlem icon to match its 1940s aesthetic, when it was at the peak of its cultural influence. New York Mayor Michael R. Bloomberg announced the first phase of the renovation project on behalf of the city and the not-for-profit in 2005. Architecture group Beyer Blinder Belle took over the project, which is currently ongoing. The theater's terra cotta facade, blade sign, and marquee at night. With help from historic tax credits, grants, and private donations, Beyer Blinder Belle restored the theater’s 125th Street terra cotta facade and blade sign, as well as the original cornice (an ornamental molding around the wall of a room). They also installed a new roof, storefront, entrance doors, and box office facilities. The most striking aspect of the restoration’s initial phase was the updated marquee, which features programmable LED visuals while retaining the classic style of the original. Next, the group will focus on updating interior finishes, add indoor seating, enhance technological elements, and integrate new safety features into the theater. During the restoration process, the theater remains open for education opportunities and live performances—most notably, the theater’s historic Amateur Nights. This regular event will continue to bring in emerging African-American artists that will reshape the landscape of music and popular culture in America, just as their predecessors have for decades before.